The Office of Postdoctoral Affairs sponsors many events on campus, including grant writing workshops, tips for applying for faculty positions, and other career development activities. To discover some of the many resources available, select an event below to learn more or search the OPA's Google Calendar . View OPA's archive of past events. ASPIRE Café for Postdoctoral Fellows "Mastering the Art of Being Interviewed"
Join the Wond'ry to welcome guest lecturer Dr. Lydia Villa-Komaroff, a pioneering scientist who helped discover how to synthesize insulin in the 1970s... and that was just the beginning. Dr. Lydia Villa-Komaroff is a molecular biologist, executive, and diversity advocate. She is a consultant and speaker, founder of Intersections, SBD and founding member of the Society for the Advancement of Chicanos/Hispanics and Native Americans in Science (SACNAS). Her storied career will be a message for all to see! Follow @tedxvandy on Twitter, @vandyleads on Instagram and @vuleads on Facebook for more information. The Prevention Procession is a time to bring awareness to sexual assault, as well as a chance to show solidarity with survivors of sexual violence. All survivors, as well as any supporters are welcome to join. After the procession portion, survivors will have the opportunity to share their experiences and the impact violence has had on their lives. This is intended to be a safe space for all and Project Safe Staff will be on hand to support anyone who may need it. Please consider bringing your friends and members of your organization to hold a sign, show support, and bring awareness to Sexual Assault Survivors. Featuring Akshata Udyavar, MS, PhD Senior Scientist Bioinformatics Arcus Biosciences, Inc.
A necessary skill for postdocs to have for career advancement is learning how to collaborate. In this session, a panel of faculty members will discuss ways to secure and maintain collaborations. Co-sponsored by BRET Career Development Office and ASPIRE Café for Postdoctoral Fellows. End of the Year lunch for the Women’s Center Parenting Group. Are you new to the US? Want to learn some tips on how to understand and work in the US university system? Need to work on your academic writing in English? This event will discuss some basics of the US university system and how things may differ from your home country. Carrie Cargile, a Language Teaching Specialist at the English Language Center, will also talk with you about some things that you may need to know about communicating in English but do not currently know to ask. And for further help, we will discuss how to utilize the programs and resources at the Vanderbilt University English Language Center. The mentoring relationship requires participation by both those mentoring and those needing mentorship. This session will focus on giving guidance to those seeking skills and strategies for engaging mentorship. Do you have a reliable and strong network of mentors? Are you struggling to cultivate mentoring relationships? Do you know the difference between a mentor and a sponsor? Are you moving to a new stage of your career and wondering how to find new mentors and sponsors that are appropriate to the next level? In this workshop, participants will examine their current mentoring network and engage in tangible strategies and skills for enhancing networking skills. You may encounter difficult times in your postdoc term – sometimes this leads to conflict with your faculty supervisor or colleagues in the lab. In this session, we will talk about how to deal with these situations skillfully so that you can continue to work together and resolve the conflict. Avoidance is not the answer – conversation is key. Stacey Satchell, Graduate Life Coach, will share tips for working through discord in this interactive session. Registration is now open to postdocs for the Tiered Mentoring Program (TMP). The TMP was developed in conjunction with the Evidence Based Teaching Workshop to find new ways to provide support for our current and future STEM faculty. The TMP focuses on helping participants navigate issues of identity and authority in a variety of teaching contexts, including classroom instruction and one-on-one mentoring in the lab or office. Each TMP cohort is comprised of senior faculty members, junior faculty members, postdoctoral fellows, and graduate students from differing academic departments. Each cohort meets monthly over the course of a year to discuss and learn about various topics pertaining to success in teaching within a faculty career. Topics addressed include self-presentation in the classroom, documenting teaching effectiveness, establishing relationships with undergraduate and graduate student mentees, time management, and self-advocacy. Additionally, there are several peer to peer meetings for the faculty group and grad student/post doc group which wll allow for discussion of level specific topics. Come for coffee, cookies, colleagues and board games – just a relaxed space. The Graduate Life Coach will host and campus colleagues will also hang out on occasion to chat. The purpose of the Certificate in College Teaching, co-sponsored by the Center for Teaching and the Graduate School, is to assist Vanderbilt graduate students and postdoctoral fellows who wish to gain a clearer, deeper, more active approach to teaching and learning in higher education. The certificate focuses on the research on learning and best teaching practices, and supports the university’s pursuit of excellence in teaching and learning. The certificate is ideal for graduate students and postdocs whose goals are to become more effective educators and who want to prepare for future careers in higher education teaching. Seminar in College Teaching. A one-semester seminar which explores and develops teaching skills. Participants attend 8 group sessions, complete a microteaching experience and develop a philosophy of teaching statement with feedback provided by a private 1:1 consultation. Additionally, participants may attend an optional teaching visit. College Teaching Practicum. A one-semester practicum in which participants enhance the effectiveness of their current teaching and assessment practices. Participants complete an observation of their classroom teaching. Additionally, participants will refine their philosophy of teaching. The Certificate in College Teaching Program is highly popular and now maintains a wait list with no less than a semester wait to get in. Wait list applicants are considered on a first come first serve basis till all sections are full. If you do not get into the upcoming semester for the Seminar, your position on the wait list will be maintained for the next cohort by the date you applied. More information and a link to seminar sign up can be found here. While all postdocs are welcome to visit the Graduate School Career Development Office, two offices collaborate to provide career and professional development opportunities for postdocs. Postdocs in the natural sciences, engineering, nursing, business, education, social sciences, or humanities receive their primary career services from Dr. Ruth Schemmer https://my.vanderbilt.edu/gradcareer/ . To make an appointment with Dr. Schemmer, call 615-343-0844 (Sheri Kimble, Administrative Assistant). Dr. Schemmer’s office is in 010 Alumni Hall of the Graduate School. Postdocs in biomedical departments and programs** (see list below) should email Dr. Kim Petrie if you wish to make an appointment. Dr. Petrie’s office is in the BRET Office of Career Development, 340 Light Hall. Visit the career development page on the BRET website, and the BRET programs for postdocs. Writing groups will be closed on March 7-8, and final groups for Spring 2019 will be April 25-26. Ongoing Activities- Shut Up & Write! You know that paper that won’t get finished? You need Shut Up and Write (SUAW) to get dedicated writing time to finally do it. SUAW groups provide a time and place to show up, shut up, and write your grant or manuscript. Learn more here. Shut Up & Write! is sponsored by Edge for Scholars and the Office of Postdoctoral Affairs. In collaboration with the Center for Student Wellbeing, Project Safe offers this 90-minute program for Survivors of Trauma. The first 30 minutes will be an informative session about the ways trauma impacts the body and the benefits of yoga practice. The last hour will be an opportunity for students to practice newly learned skills. Students of all levels are welcome to join. Contact Project SAFE to learn more. Sign up via Anchor Link. Sponsored by Project SAFE and the Center for Student Wellbeing. The Office of Inclusive Excellence is hosting a series of Faculty Writing Sessions. The sessions are part of a community building initiative targeted towards faculty to open up a space where colleagues can enter into freely, dedicate personal time towards scholarship, and build a peer network across campus that can have a great impact on faculty engagement over time. Faculty are invited to use this time to as motivation to work on personal projects that may be at any phase. The format includes time for light breakfast / networking, a brief welcome from the Inclusive Excellence Office, and writing advice from a senior faculty member before dedicated writing time (the main focus of these sessions). Registration not required but appreciated. From their website: ImaginePhD is a free online career exploration and planning tool for PhD students and postdoctoral scholars in the humanities and social sciences. Create your account and begin using this tool at imaginephd.com. Visit the Edge Bulletin Board to check their current list of national research funding opportunities with upcoming deadlines, updated often. To submit national opportunities, email Edge for Scholars. 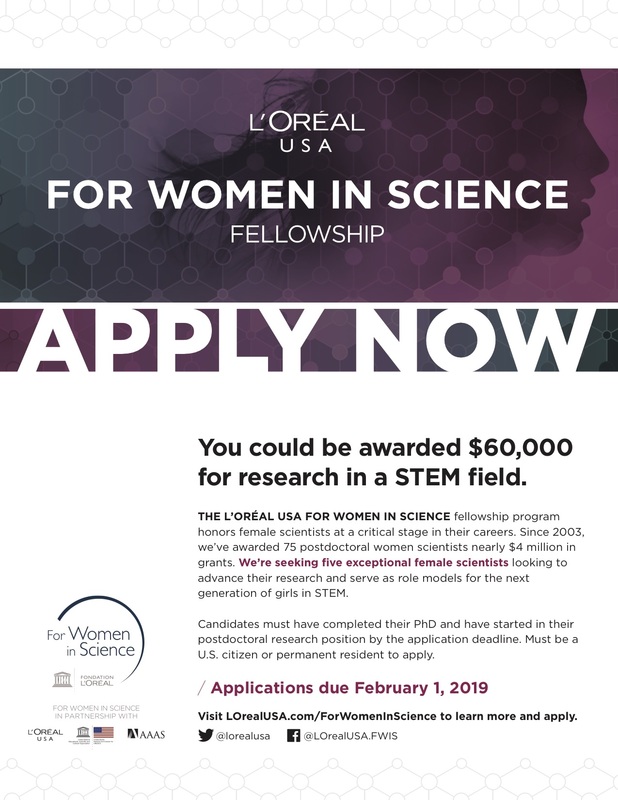 Learn more about the L'Oréal USA for Women in Science Fellowship.